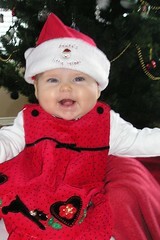 Avery is getting into the holiday spirit early and has even helped Mom and Dad put up the decorations. Posted by Anthony at 12/04/2007 11:59:00 p.m.
Oh my stars! When this pic flashed on my computer, my jaw just dropped! I declare Avery Margareth Rumsey is THE baby of the year!